Many of you will have heard that this weekend we will be treated to a lunar phenomenon known as a Supermoon. This occurs when the moon is simultaneously at its closest point to Earth and is also a full moon. There is such a lot of interest in this Supermoon effect that it has prompted us to round up some of the best moon apps for Android and iPhone so that you can find out more. In the early hours of Sunday morning the moon will be at its biggest and brightest for the year and the next time this happens will not be until August next year. NASA says that the Super Full Moon looks 14% larger as well as 30% brighter than usual full moons, and we think that many people will be looking to the skies on what NASA is referring to as Supermoon Sunday. If you want to check out any of the following Android or iOS apps about the moon, then simply click on the links to be taken straight to Google Play or the App Store. The first app we have for you is simply called Moon by App9.org. This is a highly rated free app for devices running Android 2.1 or later and is great for those who already have an interest in the moon, or for those who want to learn more. There are plenty of facts and information about the moon, as well as a Moon Gallery with images of the Earth and the Moon in different phases. You can download it here. The next app we have is for iOS device and is another simply called Moon, this time by CDV Concepts. It’s designed for iPhone and iPad running iOS 5.0 or later and is a great resource for everything moon-related. Information shown on this app is constantly updated and key features include a 3D moon model, full and new moon notifications, lunar phases, custom location settings and more. 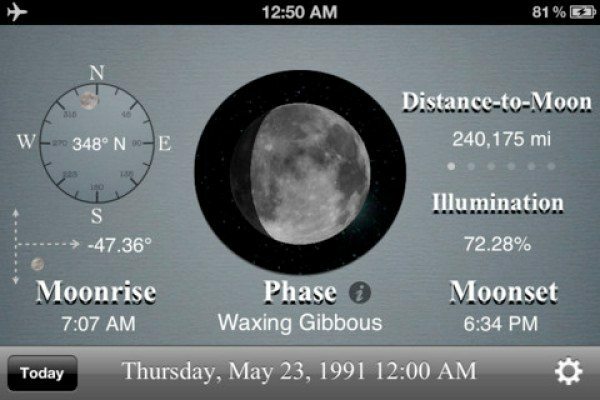 With this app you can always find out about the moon on any date in the past, present or future. It’s free from iTunes here. If you want to see a slideshow of hundreds of moon images from some of the world’s best photographers as well as NASA then how about Moon! From Italic Labs LC. This is available for Android and iOS devices priced at $1.99 and $2.99 respectively. There are some stunning photos shown with this app, and no doubt after this weekend’s Supermoon there will be some further additions. The Android version of the app is for devices running Android 1.5 or later here, or the iOS app is for devices running iOS 3.2 or later here. Another app that has a lot to offer is Moon Globe by Midnight Martian. This is a free app for iOS devices running iOS 4.3 or later and it has been optimized for the iPhone 5. With the help of this app your iPhone, iPad or iPod touch can be turned into a precision instrument for viewing the Earth’s moon. Users can manipulate the view and switch to Telescope mode, adjust the display time, and touch labels to learn more about particular features. This app uses satellite imagery and topographic laser altimeter data and you can download it here. Our next suggestion is the Deluxe Moon — Moon Calendar app by LWS Research. This one is for Android devices running Android 1.6 or later and is priced $2.00 at Google Play here. The app description claims that it is the “most comprehensive application about the moon for Android,” and also urges people not to miss the Supermoon on June 22 and 23. The app has details for the moon from your location, including times of moon phases, brightness, a moon phase calendar, sunrise and sunset times, and much more. It also features moon phase widgets, a phase scan, large compass, and automatic positioning using GPS or cellular network, to name just some of the inclusions. Finally we have an iOS app titled Moon Atlas by Horsham Online Unlimited. This one is priced at $5.99 so you would expect something pretty comprehensive, and that is exactly what the app offers. It’s compatible with iOS devices running iOS 4.3 or later and has been optimized for iPhone 5, and you can download it here. The Moon Atlas app enables the user to manipulate a 3D globe using pinch and finger gestures. The more you zoom in, the more details are shown, and there is also a realtime mode. The app has 1800 named features as well as showing the 26 spacecraft that reached the surface of the moon, and you can even try a simulated landing on the moon in the Apollo Eagle. Among this selection of some of the best moon apps available at Google Play or the App Store, we hope that you will find one to enhance your experience of the Supermoon that we are about to see. If you have any other good moon apps to suggest to other readers, please send us your comments. Also we’d like to know if you found any of the above apps particularly useful or enjoyable?